The Victory Star Series is a brass plated steel. It has a textured engraving area and is highlighted with a Florentine border and a shooting star. Plaques available in 3 sizes: 9" x 7", 10" x 8", 12" x 9"
Plates available in four colors: Black, Blue, Green and Red. This Corporate Plaque - Black Victory Star BP-VS-P912 is part of our Corporate Awards Series of products, check out other products & options available in the Corporate Awards Series of our selection. 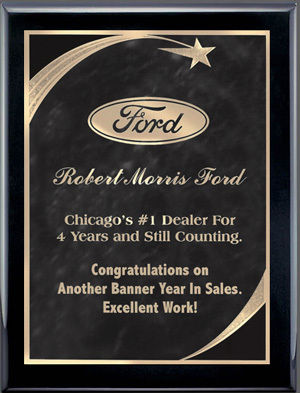 This Corporate Plaque - Black Victory Star BP-VS-P912 can be modified to your requirements and is available for your corporate award programs.